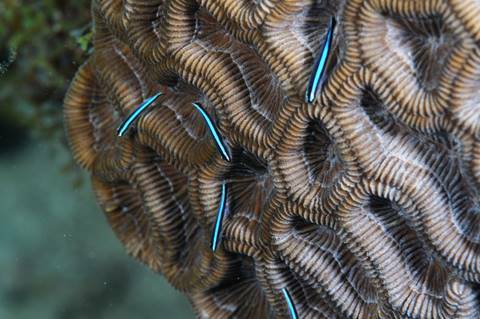 ﻿ Symbiotic Partnership Biotopes for Marine Aquarists! 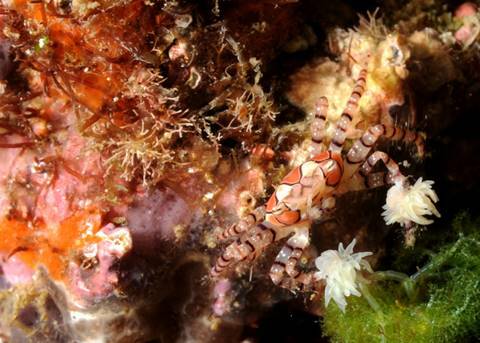 Symbiotic Partnership Biotopes for Marine Aquarists! A fave word and scientific get together for me is “symposium”; from the Greek to Latin meaning “to drink together”! is “symbiotic” with the other living forms about it; getting along and not… seeking food/s, mates, avoiding predation actively and not. The description of how one species goes about these behaviors in relation to the biotic (and non-living) matters around it is the study of symbiosis. possible display in your captive systems. For presentation sake, let’s divide these possibilities into “easier” and more “difficult” arrangements. The easy ones include set ups that are more facile to arrange and maintain; and difficult, harder and more tentative. Amongst the simplest, easiest and most enjoyable symbiotic relationship/systems is that of a prawn gobies and their partner pistol shrimp. There are many such species pairings in the wild; with the fish/shrimp acting together to (shrimp) build and maintain the shared burrow, and the fish acting as vigilant guard. These Alpheid Shrimps have poor vision, utilizing their long antennae to stay in physical contact with their Gobiid partner/s. Shrimp/Goby symbiont set ups can be very simple. A tank of two square feet bottom area will serve for just these animals alone, with more space added per other compatible livestock you might want to house with them. I encourage you to place any rock or other hard décor directly on the bottom, adding mixed substrate (fine and some rubble) after… to prevent shifting and potential crushing. I also like to give these fish and shrimp a “head start” by providing one or two pre-made burrows for them. My fave approach here is an open section of ¾” diameter PVC pipe with a 45 degree elbow attached; with the 45 open to the surface. You’ll find that these pairings are continuously free-lance, with the bulldozing shrimp refashioning and moving the burrowing tunnels as it deems fit. If you can arrange it, do leave a viewing area underneath the tank/stand so you can periodically check out what’s going on in the burrow. Don’t be surprised to find fellow cohabitants here with the shrimp, goby/ies, including Bristleworms. 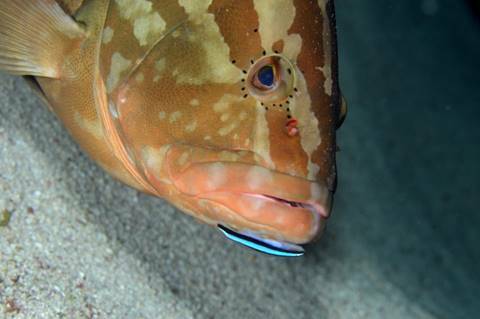 Cleaner gobies and hosts AND sponges and stony corals! 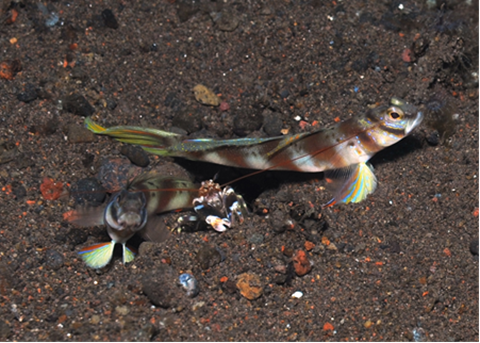 The gaudy little gobies of the genera Elacatinus and Gobiosoma are comical to watch and serve useful purpose as cleaners of necrotic tissue and parasites of other fishes; reducing stress overall. Happily, several of these brightly marked gobies are captive produced, available all-year long as aquacultured specimens. A pico reef of a handful of gallons will do if all you’re keeping are a few tropical West Atlantic cleaner gobies; more volume for hosting their symbionts if stocking, depending on their likely maximum size/s. Yes; you can/could just keep the gobies by themselves, best with a Caribbean indigenous coral or sponge species they enjoy hanging around on. Hermit Crabs and Boxing Crabs with Anemones! 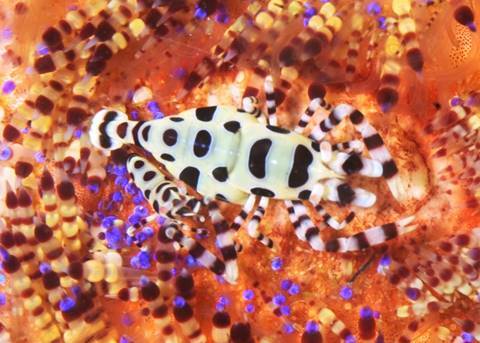 Real crabs and false, Hermits, Boxers and other crabs have come to gather and sport sea anemones to ward off would be predators. This is a mutualistic relationship with the anemones benefitting also. There’s more food to be had by being walked about with such messy eaters, and the Crustacean host defends the anemones in turn against predators. 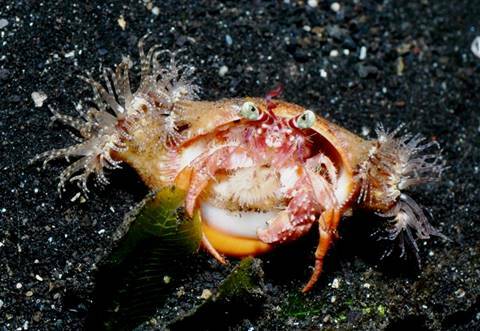 Anemone Hermit Crab, Dardanus pedunculatus and the Pom Pom Crab, Lybia tesselata shown. Balanced Parasite and Fish Hosts! There are several prominent external crustacean parasites (not to mention internal ones, worms…) that occur on marine fishes. Does your LFS sell wild-caught Clownfishes? Take a look inside their mouths, you may find an isopod lodged in its throat looking out at you. Parasites are species that live in or on another species where they derive food and/or protection. Yes; the parasite/s on/in your livestock ARE eating them, contributing to degrees in stress and likelihood of further health loss… but, successful parasites don’t kill their hosts (makes sense right? ), and such displays can make for great conversation starters. One must simply be even more diligent in sustaining stable and optimized conditions to preserve livestock health. Depending on the size of your host, your system might be quite small, a micro to pico reef in the case of gobies and blennies for instance. Shown: A Hind, Cephalopholis fulva and isopod, and Eviota guttata with a parasitic copepod. 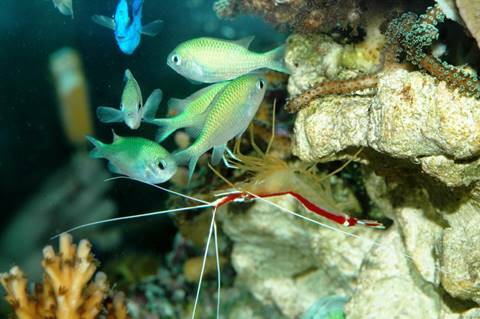 In the wild, cleaner shrimps set up stations that are regularly visited by host fishes looking for services for removing necrotic tissue and parasites. Skin and scuba divers look for these stations and count on them for bringing photograph possibilities to the fore. 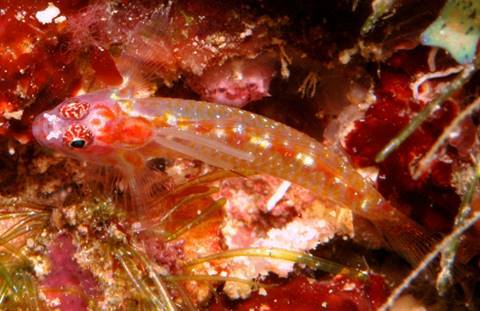 There are several species of cleaner shrimps, and most all fishes will beg for their services. In captivity, you’ll need to have a system large enough to not only house cleaners and hosts, but room for them to live together otherwise, as cleaners can become overly aggressive. I suggest a minimum four foot long tank, bigger if stocking larger fishes. 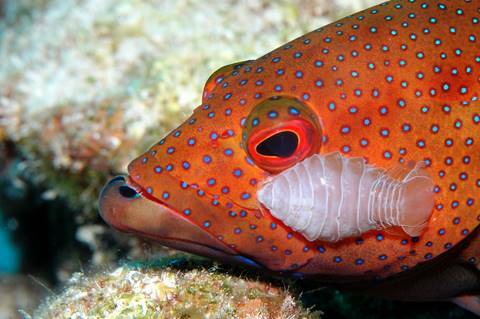 Cleaner Wrasses of the genus Labroides. This association is very well studies (I wrote about it in the 1960s), and encompasses five Wrasse species of the genus Labroides and most all Indo-Pacific reef and reef associated fishes; including visiting Manta Rays! 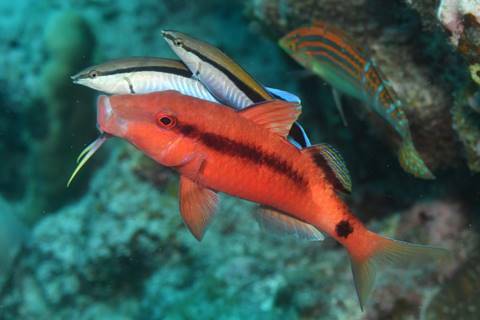 Labroides establish regular cleaning stations where a myriad of customer fishes come about, visit, turning color, adopting odd spatial orientation to get the Wrasses attention. Some consider the color changes merely endocrinological, others that they’re a mechanism for “showing up” bad body areas, parasites, perhaps both influences are at work here. Happily, two species of Labroides, the most common L. dimidiatus and the near-Hawaiian endemic L. phthirophagus are aquacultured for hobbyist use. These captive-produced specimens are FAR more adaptable, likely to live in aquarium conditions. Ask for them from your dealer. Labroides themselves are best harbored in as large a system as practical; a minimum hundred gallons or more. Larger tanks are the rule in consideration of how many of what types and sizes of cleaning customer fish you intend to stock. Labroides can be trained to accept “regular” foods, i.e. they’re not obligate cleaners, but facultative. 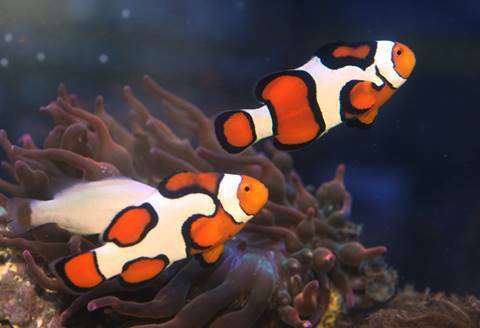 Clownfishes and their large Indo-Pacific anemone symbionts are a classic form of mutualistic symbiosis; and though Clowns will associate with other living and non-living materials; indeed, captive-produced ones don’t need a host at all, there is nothing like “Nemo” cavorting in its anemones tentacles. In the wild, all Clownfish species are associated with Anemone hosts; the fish receiving protection from predators, and in turn protecting their anemone; sometimes even feeding it. In captivity this bond isn’t necessary, particularly for aquacultured clowns. Aquarium choices for suitable anemones are easy here: The Bubble Tip, Entacmaea quadricolor is the absolute best, with asexually clones being readily available and even hardier. This Anemone species is the widest associated in the wild, and can become acclimated by every Clown species . For smaller species like Ocellaris and Percula Clowns, a tank of forty gallons will do for both fish and Bubble-tip. 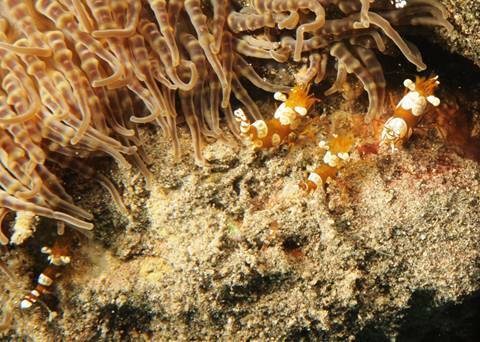 This species of anemone inhabits rock crevices, so you’ll want to provide this sort of bommie. The comical, colorful chubster gobies of the genus Gobiodon are always found in intimate association with genus Acropora, Staghorn Corals. And bonus! These hermatypic (reef-building) corals are great examples of mutualistic symbioses themselves; sponsoring endosymbiotic zooxanthellae algae that remove/convert wastes to food and make oxygen (electron transfer), and calcium carbonate/skeletal aiding enzymes; removing carbon dioxide while making a home for the dinoflagellates. The gobies themselves may be kept with dead skeletons or facsimiles in quite small volumes (picos), but housing live Acropora calls for larger, more easily stable settings like forty plus gallon systems. If you have no overtly piscivorous fishes you could try keeping Gobiodon with your “colored sticks” in a large, mixed reef setting, though some will pick on SPS. 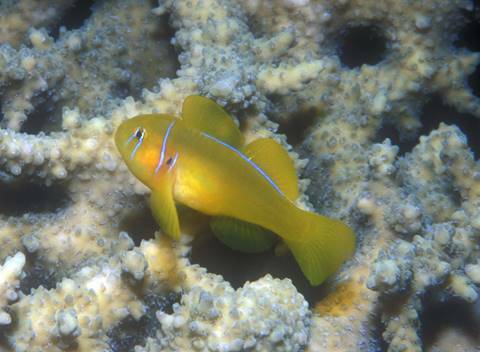 Shown; a Gobiodon citrinus perched on its Acropora home in the Red Sea. The families Palaemonidae and Hippolytidae replete with dozens of species of little, colorful and clear bodied shrimps that live epizootically on Echinoderms and Cnidarians. These are commensal to mutualistic relationships with degrees of benefit to the shrimp symbionts and their non-shrimp hosts. The real task here is finding specimens that are still associated/alive after the rigors of collection, holding and shipping. If you have the dive-adventure bug, you’ll find that these are quite common associations in the wild. When at your LFS, carefully examine their newer arrivals for shrimps amongst the spiny skinned animals and corals. Full-blown reef conditions are called for in maintaining these animals together; taking express care to pre-mix new/change-out water and adding any supplements used there, rather directly into the main/display system. Symbiotic relationship study is akin to narrowing down your view of a given species in the world’s bio-web. All organisms are part of symbioses; as mutualistic, commensal partners of varying kinds to competitors, predators and prey to different kinds of parasitic dependency. Putting together these displays and studying, observing symbiotic interactions is great fun, and more importantly should serve as clear lessons in the web-interrelated arrangement of all life on our planet. Commensalism: a situation where one organism benefits and the other is not harmed. A fave example is the relationship between remoras and sharks (and other animals), where the remora gets scrap food and possibly protection from predators and their “ride” is unharmed. Mutualism: the condition where two species are associated where both benefit. For many people this IS the definition of symbiosis. I think of Clownfishes and their Anemone hosts here; where both are intimately reliant for protection from predators by the other. Parasitism: relationships in which one species of organism gains (food, space) while another species it lives in or on is harmed. This condition is further defined as continuous, temporary or protelean (where only young are dependent on a host). Tapeworms (Cestodes) come immediately to mind as parasites of marine (and terrestrial) animals. Endoecism: where one animal utilizes the burrow or tube home of the other for (temporary) shelter. I state an illustration of endoecism below twixt shrimp/goby symbionts sharing their tunnels with Bristleworms. Inquilism is a more intimate sharing of a refuge; a greater degree of dependence than endoecism. In zoology an inquiline animal is one that shares such a habitat. A great exemplification and name is the Fat Innkeeper Worm (Urechis spp.) that host some temporary fish guests as well as permanent ones like pea crabs and scale worms. Epizoism: “upon” and “animal”; where one species lives on the outside of another; not necessarily parasitic. You will find a few paradigms of epizoism in this piece; gobies living on the surface of stony corals, sponges. Symbiont: the more active partner, focus in a species-species relationship. Host: the more acted upon partner, focus… depends on your perspective, interest.